Welcome to a Free Gamer special! People often accuse the Free software and open source game sphere of lacking depth, that there are few good games. In 2009 Free Gamer is dedicated to dispelling this myth. As part of a series of articles on specific genres, highlighting the games that people develop for the love of development in order for us to play, I humbly present a set of reviews of open source city building and tycoon games. I try to be fair and critical, and I note that these games are all enjoyable in their own way. They are all certainly worth a look. I started with OpenTTD 0.6.3 - being the only formerly commercial game I'm covering today, it is good a metric for the others. Still, it is not quite Free software, you need the abandonware Transport Tycoon Deluxe to run it. The community has been working on a project called OpenGFX to create both drop-in and high-resolution graphics to replace the proprietary materials. They are getting there, but I don't think they'll be complete before the end of this year. I've been playing Transport Tycoon since I was a kid. The gameplay comes naturally to me, and is easy to get into. (My 8 year old son was playing with it after only brief instruction.) The great thing about OpenTTD is that it is polished. Everything works, and works well. The user interface is very nice - although sometimes you do get overwhelmed with windows. Game performance is exceptional, with a lot going on it was consistently smooth and never laggy. Which it shouldn't really be, considering this is a 10 year old game and I'm on a 2 year old laptop, but suffice to say these days my expectations are low! There is one big problem with OpenTTD though. Once you work out how to connect a couple of industries or cities, the game challenge disappears. Almost all non-fluffed transport links are profitable and the AI is awful (although this is getting remedied by a new AI framework due in OpenTTD 0.7). There's no end goal, nothing other than building your bank balance and big networks and cities (which you can only influence, not control). It all gets a bit repetitive after a while. Despite the "reality" setting, the game world barely comes across as real. Towns are evenly spread out, but not connected with roads (you have to build them). You basically mould the map by placing down transport routes. Other than industry locations, you don't have to accommodate the game world much; it accommodates you. The game needs to be tougher. Industry connections should be specific to deals between individual industry companies. You should be able to drive your competitors away by competing with them for contracts. There should be more limits on where you can build (contracts with councils, perhaps), shaping land should be more costly, there should be an element of challenging to getting up and running highly profitably. There's no station management - all rail stations are the same, roofed or not - no additional parts, just stations. Also there is a lack of passenger chaining. Big passenger stations have a limited catchment area, if you have other vehicles 'unload' passengers at them then those vehicles basically run on a loss. The gameplay is simple, but it is too simple, and that is why I don't play the game any more. Overdue Update: The Simutrams community constructively took onboard my criticisms. Whilst I should have looked harder - there was a Starter Guide and other documents available - they have made documentation more accessible and prominently placed. The Simutrans wiki is a good resource for learning how to play the game. Next up was Simutrans. Unlike OpenTTD, it is totally Free software, which is a good start. This is a difficult one, both to play and review. Although the website lists version 0.99.17 as stable, the forum lists 101.0 as the stable download and is more recent so I went with that. There's plenty of nice graphics packs readily available although only a few are really playable. I tried pak128 and pak96.comic - both aesthetically pleasing and supposedly playable. The main menu music is horrendous. I know Germans have famously bad taste in music (the original author is a German guy) but the tune that greets you at the main menu is grating and negative. It's obviously a classical track in a minor key, but I can't see how that epitomises tycoons and enterprise. The user interface is a poor man's version of the OpenTTD UI. Often unclear, with frequent trivial glitches (text overflowing etc), it's just a bit messy and thus not quite so pleasant to interact with. Game performance again was very good - I remember it being quite poor when first tried Simutrans several years ago - and comparable with OpenTTD for smoothness. In the end, pak96.comic was not playable. I tried to create a passenger line and couldn't even build a train depot, it wasn't in the rail build options. No depot, no trains (no other way I could find to access a train building dialog). This is fine, pak96.comic is listed as alpha although the screenshots show quite a bit off so I hoped it'd be more complete. Update: I had chosen too early a start date, so no trains/buildings were yet available, but this was not clearly documented anywhere, you had to read the fine print! However pak128, which is becoming the de facto graphics pack for Simutrans, is definitely playable. It looks good and distinctively different from OpenTTD. Towns are more dispersed, are connected with roads and have more character. People and cars appear on the streets. Industries appeared more diverse, with more types of goods to chain together and deliver. It made me really want to like the game. Then I tried to build some railways. Actually laying the track was trickier than it should be, especially diagonally which was very fiddly. Also if you build a straight track, if you were not careful to overlap each section you created, tiny hard-to-see gaps would be left in the track. I assumed that these would be problematic for trains, but when it came to creating trains I was just lost. I managed to set up a depot and build a train. Frustratingly I could only build a train with a single passenger carriage. Any other combination didn't work. Basic dialog controls seemed to do strange things. Line management was unintuitive enough to make me start over. I made more progress with buses, and started to work out the line management. 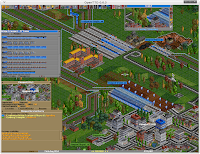 If you can work out how to play Simutrans, and overlook some of the aesthetic flaws, it looks like it has more to offer than OpenTTD in terms of gameplay depth. There was more complex road management options, passenger networks, trams, station buildings, different types of stations. Less wash, rinse, repeat route building strategy and more adapting to the game world. It just lacks the polish that OpenTTD has, and lacks a good tutorial and an intuitive user interface. FreeRails2 0.4.0 is a continuation of the FreeRails project (and Railz too?) as well as a spiritual successor ("clone") of Railroad Tycoon. I used to play Railroad tycoon as a kid - it's the original tycoon game. It's both challenging and fun, although you don't have to worry too much about your trains colliding and other formalities as your trains zip up and down and past each other without a hitch. The graphics are basic but not bad. Performance is fair - it made my laptop fan run hard but the game itself was smooth. One of the nice things about the game is you can run it straight from the webpage, no messing about installing or updating. You can be up and playing within moments of visiting the homepage. The gameplay is fairly straightforward. Create a rail network between cities and industries, assign trains to visit the stations. Trains can change their cars at each station, so one train can pick up livestock, deliver it to a factory, then return with the resultant goods. There even seemed to be an automatic option for trains - create a train without any cars and it will grab whatever is waiting at the station it arrives at. It's a nice game but it misses some of the charm of the original Railroad Tycoon. I'll probably have another go at it another day but - having played the original a lot when I was young - I'm not driven to play it. I think it's a few features short at the moment. Fortunately development seems to be ongoing - 0.4.0 was released in August last year. FreeTrain is billed as the "quintessential sandbox game". It has so much potential, the graphics are nice with a lot of attention to detail, there's hundreds of plugins and you can create amazing cityscapes with variable height skyscrapers and all kinds of buildings. It is a transport simulation and city building game combined. There's a reason I have championed development drives for it for so long. However, being a sandbox is a big problem. You start with a big blank piece of land. Sandboxes work on wikis where you can test out features and not worry about it getting wiped out. Yet, you don't create an entire wiki in a sandbox. FreeTrain lacks a Linux port and a save game format (and thusly a scenario format) which means it is full of potential but more a toy / tool than a game at the moment. Hopefully development will pick up again soon. If you know C# then please get in touch with me and help restore this game to the scene. Micropolis is the original Sim City classic repackaged with a new name. Not much more to say, really. Ok, I'll make more effort than that. It looks very dated, and the game world looks tiny when juxtaposed in a large window at today's resolutions. Still, it is the grand daddy of city building games although sometimes is quite basic in it's mechanisms. You assign residential, commercial, and industrial zones. You build power plants, connect electricity grids, and manage taxes, and decide how to allocate emergency services. Occasionally you get to fight off Godzilla. Possibly a good starting game for younger players as there is less to grasp. The limited nature of the game is shown by just how quickly the official forum expired. The most interesting thing about this game is that it was released as Free software as part of the One Laptop Per Child (OLPC / XO) project. LinCity-NG is the GotM fork of LinCity. 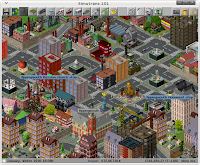 LinCity is a kind of Sim City classic clone. It looks equally dated but has a different slant on city management, which LinCity-NG builds upon. LinCity-NG has much nicer graphics, and many new features. The autopackage would not install so I had to build it from source. Performance is pretty poor. Movement and animation was very laggy on my laptop, the music stuttery. The music was good and original although loops on the same track rather than cycling. The user interface is original but a bit messy with icons overlapping button borders and lots of scrolling required to read text that is presented in a huge font. Saying that, the help system is very useful. A description of pretty much any game item is just a click or two away, and tooltips are there for extra hints. This makes it much easier to get into than Simutrans where I was guessing at half the controls. The game itself has quite a few angles to it. For once roads in a city building game serve a function other than being a requirement for buildings to exist. They enable greater transportation range of goods and materials between different types of buildings. You have to generate resources and jobs, and research technologies to gain access to new types of buildings. In some ways, it merges aspects of civilization building games with a city building game, which is a unique approach to the genre in my [limited] experience. You can even win the game by transporting your city population to another planet. I couldn't quite overcome the poor performance. Moving around was just too slow to be enjoyable. LinCity-NG has come very far in the last couple of years, and it shows a lot of potential. Interesting gameplay ideas and nice graphics bode well, and with some tweaking, optimization, and improvements to the user interface this game could be a real Free software star. I hope they rename the game to an original name now it is departing from it's LinCity roots. It can't be Next Generation forever, and it's no longer really "Lin"City as it is ported to multiple platforms. OpenCity is the only 3D game in this list. 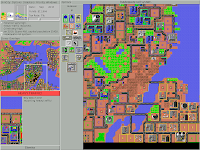 At version 0.0.6, it is still early on in development, you can create basic 3D cities in OpenCity, but the gameplay is limited and it won't capture a player's attention for long. Development has been steady for several years, and with more people showing an interest in contributing this is one for the future. Well I think you'll agree there's plenty of choice and lots of fun to be had. There's many different styles of game to suit many different player types. "The main menu music is horrendous. I know Germans have famously bad taste in music..."
Yeah, the most Germans have a bad taste in music. We listen to all this horrible hip hop, metal and punk rock music from America or UK... tsk definitely bad taste. ;) Ramones, Dead Kennedys and Toy Dolls FTW! I don't believe anymore that something like bad taste exists, there's only main stream or non main stream. Same goes for computer games. Ever played a game like Dwarf Fortress? It has got only ASCII graphics, but the game is great IMHO. I guess the most people wouldn't even touch it. Besides that I wanted to say great blog/website. Keep up the good work. Concerning the afterword - I would actually say that there aren't enough valid options. Most of the ones that exist are merely transport tycoon spin offs - when it comes to good city simulators, I think there is nothing that can actually compare to the official Sim City games, which is sad because those are pretty limited in scope and tend to get boring really fast. And I know of no nation scale city builder like the Rome games used to be. Jean-Francois: I need contact details or for you to email freetrain-devel@lists.sourceforge.net or me personally on freegamerblog ATTT gmail DOTTT com. I installed LinCity-NG on my computer with the Windows build, and didn't have any performance issues. Didn't like the game too well. Perhaps because of the same things Johannes mentions; I'm not really used to this kind of gameplay, so that's probably the reason why I didn't like it at first glance. NO THERE ARE NOT ENOUGH OPTIONS! Also thanks for the link to FreeRails2. FreeRails project had died as development stopped few year back. Will update my links. Btw there's new UFO:AI monthly update up at their site. Regarding OpenTTD AI stupidity (which is a problem that existed back with the original Transport Tycoon), the AI framework (and some decent AIs) already exists in trunk. You can also play the latest trunk with no original game files at the expense of having no music or sound effects. OpenGFX allows you to play the game although some train engine graphics and town buildings are black rectangle placeholders, and much of the "toyland" climate is missing. A lot of this can be fixed by downloading other (free) trainsets, and town graphics. What you have said is true of any released version though. Regarding how easy the game is, that is a common complaint in the community (which was just as true in the original Transport Tycoon game). There are some mods which increase the costs of things. Regarding passenger destinations, a branch was in development which meant that cargo had to be delivered to a specific destination, but it seems to have stalled a couple of months ago. Regarding vehicles which "unload" and make a loss, that is solved by telling it to "transfer" instead of "unload". "Next up was Simutrans. Unlike OpenTTD, it is totally Free software"
AFAIK there are free GRFs, so that OpenTTD can be played fore free without owning TTD. "i think no game is playable (in a broader sense) until at least a 0.7 version or similar..."
Okaaaay. Version numbers are not a reliable guide to anything. One man's 0.5 is another's 3.0. And Simutrans is the only finished game here? Really? You're saying that even Micropolis wasn't finished yet when they released it to rave reviews and massive sales, almost 20 years ago? FreeTrain looks like it might be awesome (Big OpenTTD and Simutrans fan here, as well as trains in general), but I just can't seem to figure out where to start. Is there some sort of tutorial out there to teach the ropes? Pak96.comic for Simutrans is playable. I don't know where is the problem that there is no depot. But on the linked screenshot you can show the train-depot. And there are some rail-cars. Wow! I've been looking for that game for months, after hearing about it and forgetting it's name a while ago. Thanks! Great to see it's going open source. What a gift! Do any of these compare to the Sierra Caesar games? You know, Caesar 3 etc? I just got out Caesar 3, and promptly spent an hour on a city without even knowing where the time went. Of the games above, LinCityNG is the only one I really tried, didn't come even close. I wish that free software programmers would take a look at the classics and try to at least, match them. Hi, I have a question about an older blog article. You said Glest is dead and the development is now at GAE. But the "official" anouncement is gone, Glest 3.2.0 was just released, and nobody cared about this mysterious death news. Was this all a joke? I thought Charles said that the glest ENGINE was dead in development..
"Glest (the 3D RTS) is dead, long live Glest! No, really. Mainline Glest development has ended and Glest Advanced Engine (information), a community-born enhancement, is to officially become the new Glest. Glest Advanced Engine is a project built on top of Glest, that adds new features to the game, it includes both new code and data"
It clearly says Glest development has ended, but GAE (a Glest mod or fork) will go on. But all news, posts and discussion (there was only very few discussion about this anyways) about this issue is suddenly gone from the official Glest forums (it's deleted) and instead there's a new Glest release (not only the engine). I find this a bit mysterious. Yes, that's GAE, a fork of the old stable Glest. It needs the old stable official Glest to run. But now a new official Glest came out. Don't know what will happen with GAE now. But aside from this, I always found that the public information about Glest and Glest forks development ist a bit strange (or let's call it "unordered and incomplete"). You never really know if it's dead or alive or what fork is actually being developed, there are no real news (only when there are releases - and they come always very surprising, like it was now with Glest3.2.0). To be honest I don't think you gave Simutrans enough of a chance though. The interface is certainly a bit rough around the edges, but the game is infinitely deeper than OpenTTD or probably any other transport sim. You didn't use the official pak (pak64), and since this pak is developed alongside the game engine, it tends to offer the most cohesive experience of the game. Also, Simutrans addresses most of your complaints with OpenTTD; it is much harder to make money, passengers and cargo have destinations they don't just go wherever you take them, and the AI can actually put up a fight. I think it takes a little bit more getting used to than you gave it. Overall though, I liked your article. I enjoy both OpenTTD and Simutrans, though lean slightly towards Simutrans after a serious comparison of the two. I wrote the whole lot up in OpenTTD Vs Simutrans | Linux Tranport Simulation Showdown. Want a challenge in OpenTTD? Just join a multiplayer game and compete with other people. Also now it's completely free, 1.0 series of releases can auto-download OpenGFX and OpenSFX for you.